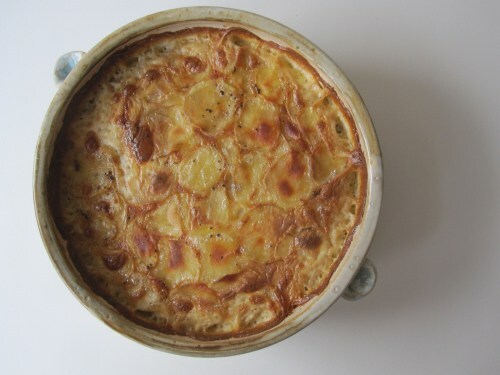 I am not blogging at the moment (because I’m moving house…) but that doesn’t prevent me from sharing a magnificent recipe from Daria’s kitchen. Posted in French recipes. Bookmark the permalink. 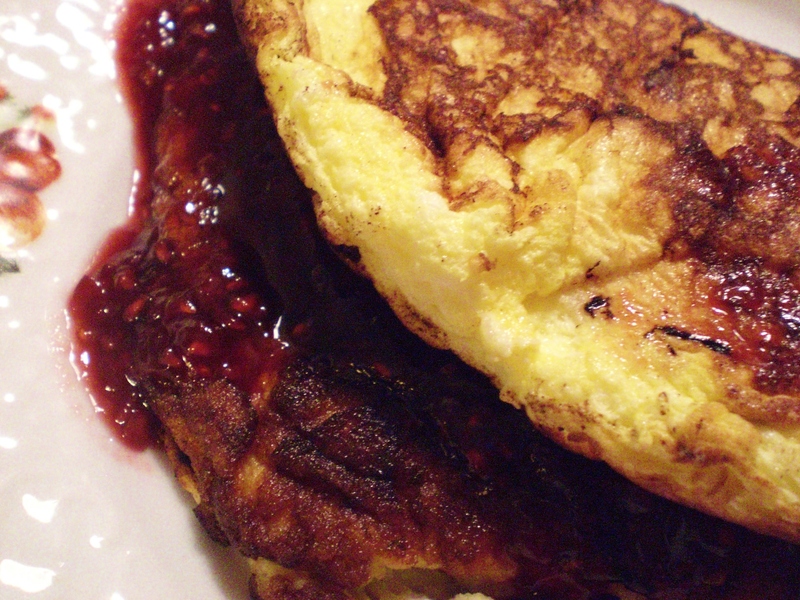 A French recipe: omelette soufflée à la confiture, a French word: confiture. Eggs are such good value. And so versatile. And sometimes the only thing one can find in the fridge. Just on their own they can become boiled eggs with soldiers, scrambled eggs on toast; with maybe a little bacon found in another corner of the fridge, fried eggs and bacon, a crispy bacon omelette; with a bit of cheese, a cheese soufflé; with a little milk and sugar, crème caramel. I could go on and on. For my recipe today I have chosen eggs with a little bit of jam (or jelly) literally to whip up a spectacularly good dessert. Past participle : confit (m.), confite (f.), confits (m.pl. ), confites (f.pl). Example: du canard confit (preserved duck), une cuisse de canard confite (a preserved duck thigh), des fruits confits (candied fruits), des violettes confites (candied violets). Un confiseur is someone who makes sweets, une confiserie is a sweetmeat. Melt a tbs butter a non stick frying pan. 20cm-30cm diameter should do the trick. Break the eggs, separating the yolks from the whites into two separate bowls (make sure there is absolutely no yolk (or shell) in the whites and that your bowl is very, very clean, or the whites won’t whisk up firm). 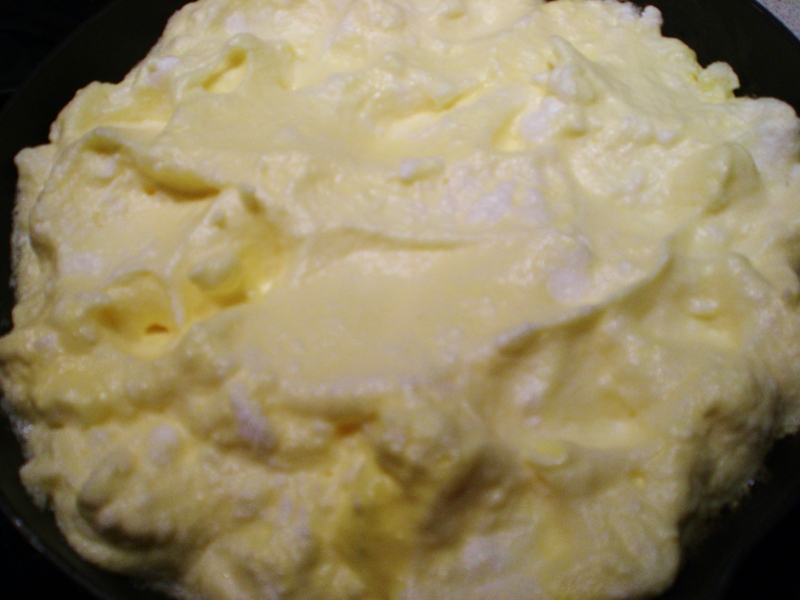 Whisk the yolks with the sugar until they form a ribbon (un ruban) https://onefrenchword.files.wordpress.com/2014/01/omelette-soufflc3a9-ruban.wav (i.e. until they pale and thicken). Beat the whites with a pinch of salt until they are very firm. Half way through the process, add 10gr sugar. Gently fold the whites into the yolk mixture. Heat the frying pan and pour the egg in slowly, letting the base sizzle to prevent it spreading. Pat the whites down gently with a spoon, so that they reach the edge of the pan. Cook slowly for about 4 minutes, shaking gently to prevent sticking. If it does, loosen with a palette knife. 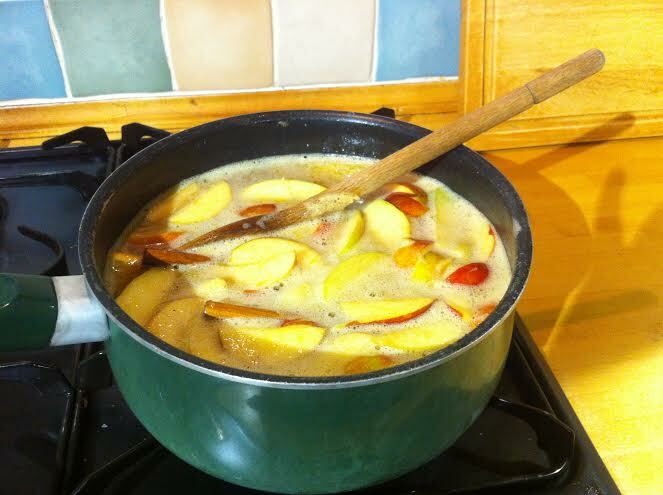 During this time, warm 1-2tbs jam in a small saucepan with the alcohol if you are using it. 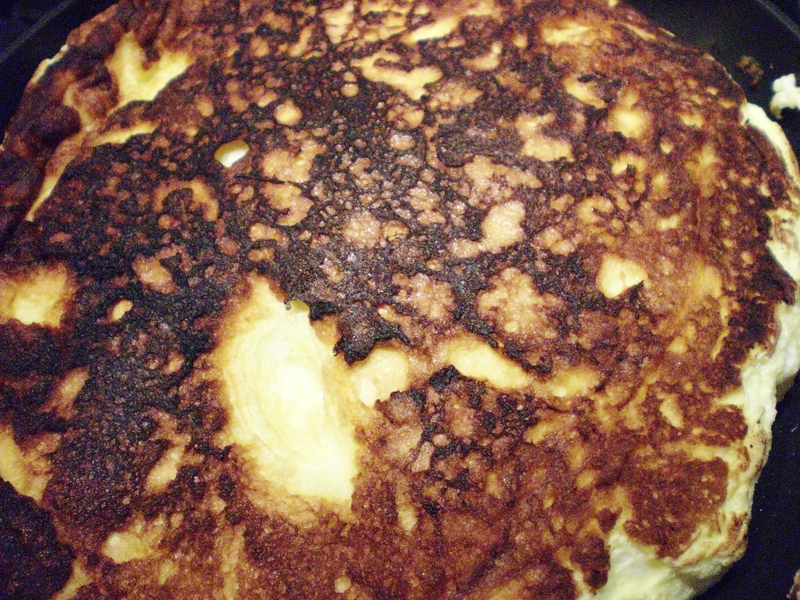 Place a large plate over the pan and turn, to deposit the omelette on the plate. Melt a little more butter in the pan and slip the omelette back into the frying pan. Cook the second side for about 2 or 3 minutes. 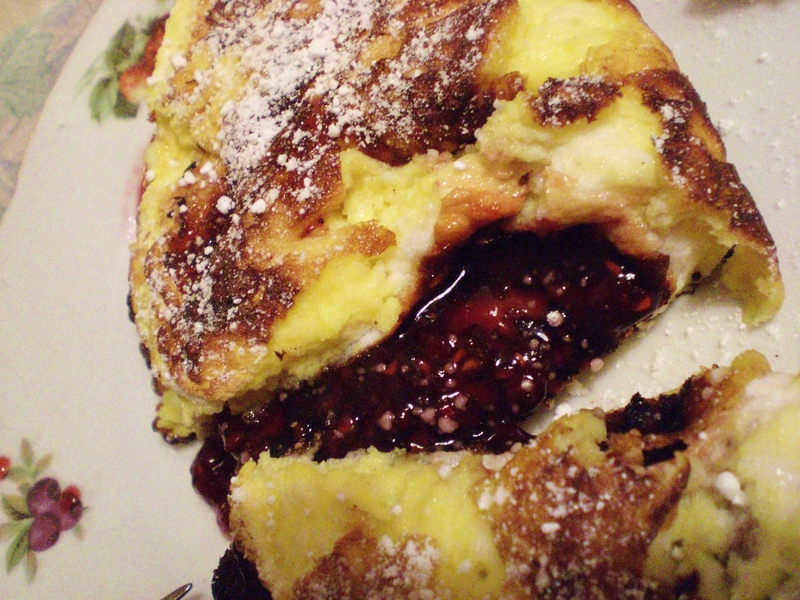 Spread the heated jam over half the soufflé omelette. Slip it onto a heated serving plate, fold in two, sprinkle with a little icing sugar and serve. 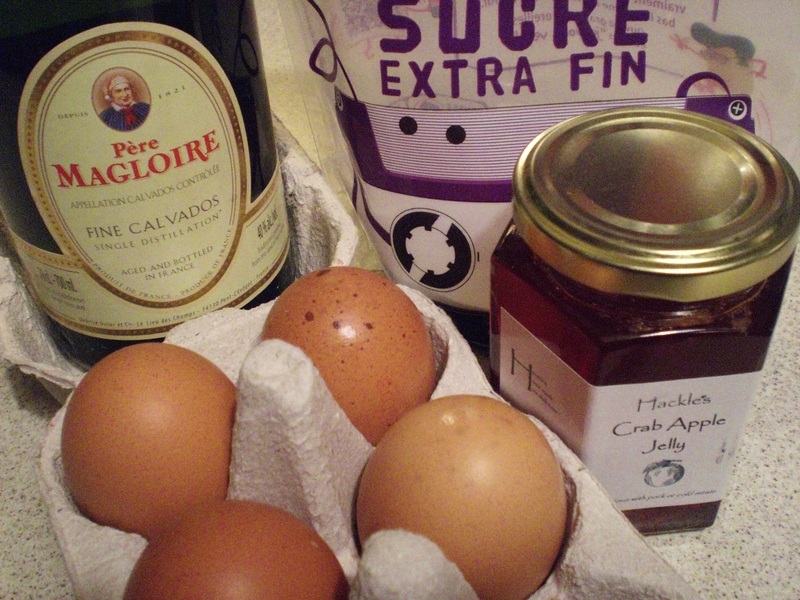 If you use alcohol, you can actually do without the jam (add the alcohol to the egg mixture instead). You can also use a small quantity of alcohol pour flamber (to set alight to) your omelette just before you serve. But don’t hang around, the soufflé will start to sink quite rapidly. This is an excellent dessert to do when you have unexpected guests, because it uses nothing that you don’t usually have in your cupboards. But it does become complicated when you are cooking it for several people. Four is about the limit. We have just had exceptional tides here in the Finistère, together with storm winds, enormous waves and torrential rain. But when the tide is out, far out, the sands are dotted with people digging for shellfish. Palourdes are plentiful this week, and cheap for once, so I bought a few to spoil myself. frais (masculine adjective), plural frais, feminine fraîche, plural fraîches. Examples: de la crème fraîche (fresh cream), du pain frais (fresh bread), une haleine fraîche (nice breath), des fruits frais (fresh fruit), des huîtres fraîches (fresh oysters). The noun is la fraîcheur (freshness), which can also be used of temperature: la fraîcheur du matin (the cool of the morning). 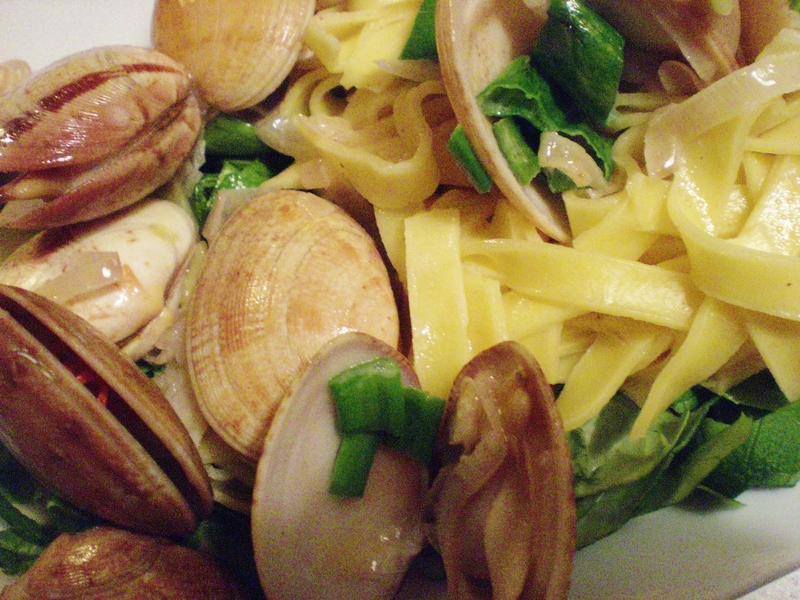 My recipe is simple and delicious, you just have to be able to get hold of palourdes or clams. You can quite well use dried pasta, just adjust cooking times, and it doesn’t have to be tagliatelle. 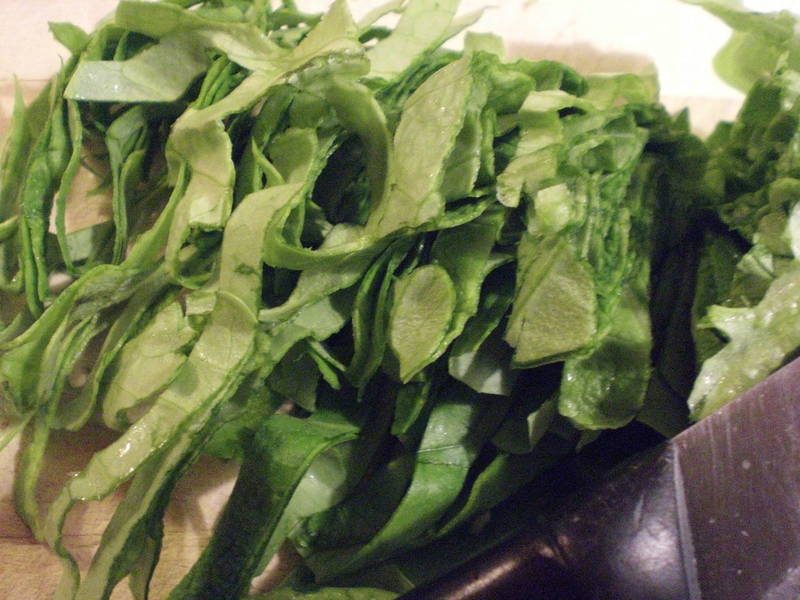 Wash the lettuce leaves, roll up tightly, and cut into a chiffonnade, that is, very fine slices, excluding the stalks at the end. In a heavy bottomed pan, melt the butter and fry the shallot until transparent. Add the glass of white wine, stir, bring to the boil and throw in the clams. Stir and put the lid on the pan. 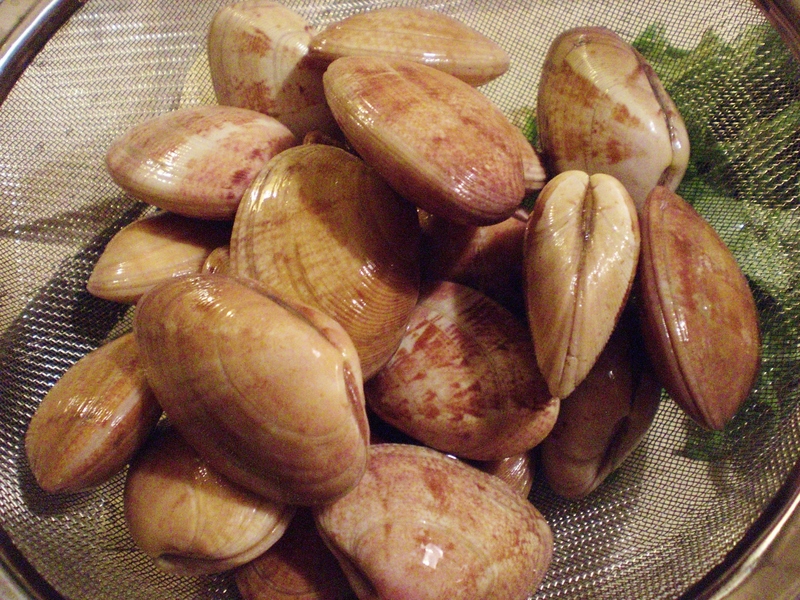 Lift the lid and stir occasionally so that the clams cook evenly. They should just open, if you cook them longer they will be tough and tasteless. This takes only a few minutes. Put the pasta into the boiling water in the other pan. Bring back to the boil. Fresh pasta should only cook for a couple of minutes, watch it carefully so as not to overcook it. Add the cream to the clam saucepan and some freshly ground black pepper, stir well, turn off the heat. 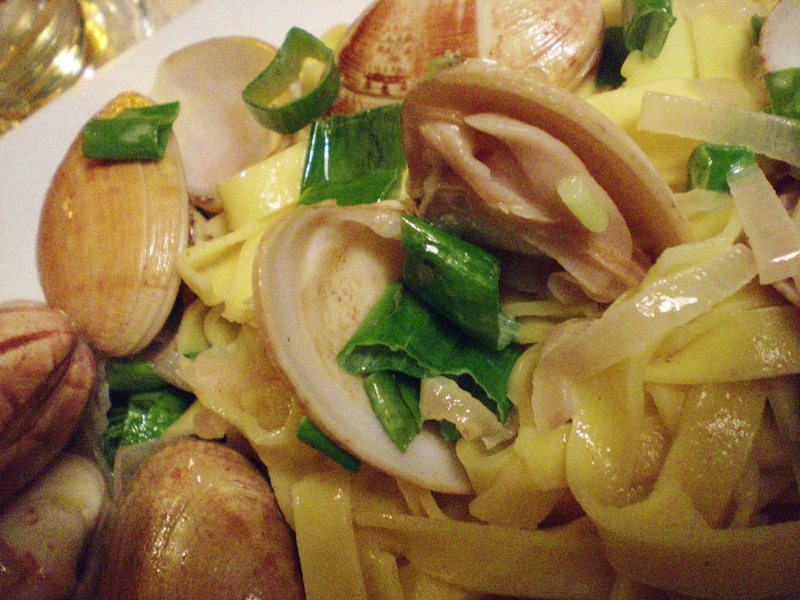 Place a layer of chiffonnade on each serving plate, place pasta on top, leaving some lettuce showing (it adds colour and some nutrients), ladle clams on the top of the pasta, with a generous serving of juices. 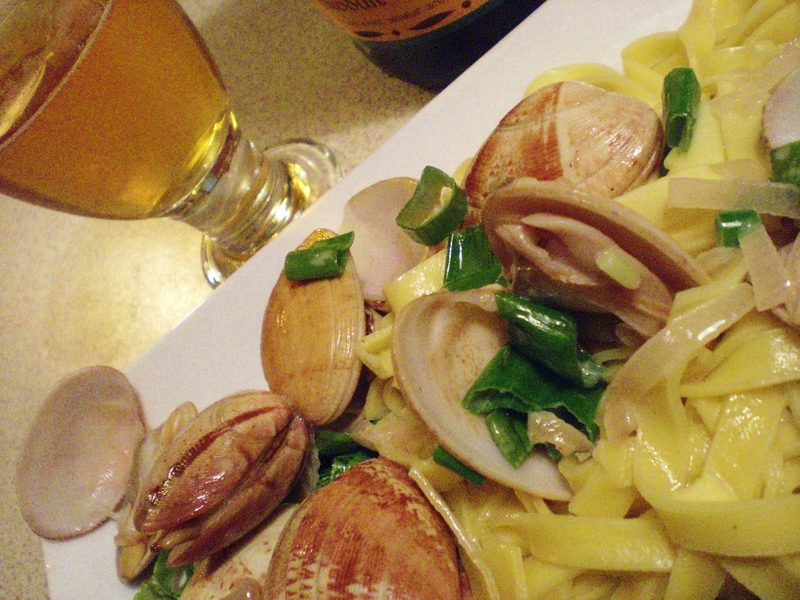 You can also, and I think this is more typically Italian, add the pasta to the clams and stir before serving, to coat the pasta with the juices. Serve quickly with fresh, crusty bread. Posted in Adjectives, Feminine Nouns, Fish, French recipes, Main courses, Nouns, Pasta and tagged clams, Cook, France, French food, French pronunciation, French recipes, learn French, palourdes, pâtes fraîches, pronounce, Recipe. Bookmark the permalink. There are so many foodsites and blogs, my inbox is sometimes a little inundated, since I’m an inveterate foodie and don’t want to miss anything. I sign up for everything, then find I don’t have the time to read it all. A drastic selection has to be made just from the three or four words appearing in the title line. But some I always open, knowing from the sender’s details that everything will be worth reading. May I share with you the ones that I find most worthwhile? Katerina is based in Vancouver, and regularly comes up with really interesting recipes, of which a lot are of Asian origin, my favourite food area of the world! 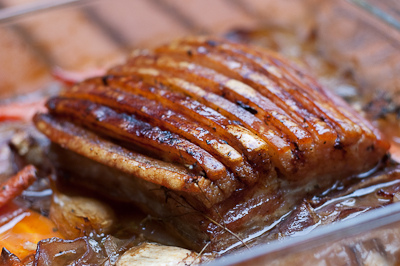 But I have chosen her Slow Roasted Pork Belly to share here, it is mouthwateringly good and the photo really makes you need to go straight out and buy a piece of pork! Lisa Leake really follows and expounds upon my own ethic, that of avoiding processed food at all costs, which is, I should imagine, far easier to do in France than in the States! Her recipes are simple, manageable and delicious. She has just finished her first book of recipes and tips, which is available for pre-order on her website. 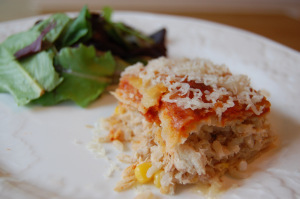 Here is her recipe for Chicken Enchiladas. Laylita is from Ecuador, and has a wonderful website with recipes from South America (a special section on Ecuador), as well as others from around the world. She has a stupendous collection of ceviches, as you can see from the photo below. I like especially the spiciness of her recipes and the wonderful photos. 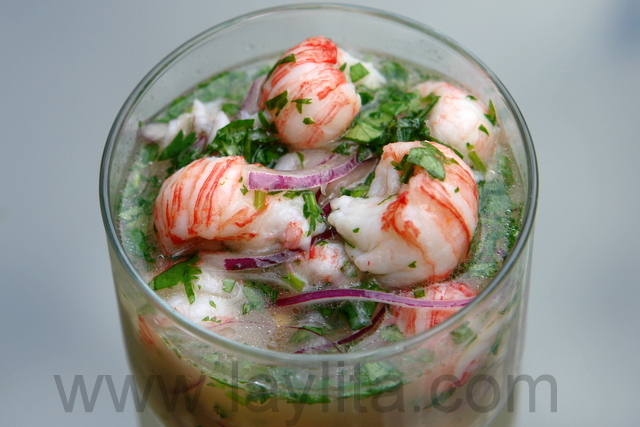 This is her recipe for Langostino ceviche, but if you can’t get langoustines, she has other recipes for oysters, plain fish, and even vegetarian ceviches. This is a very nifty, family-run website (which means extremely friendly and quick to react to comments and problems). It allows you, with an app on your toolbar, to copy to your account’s recipe book any recipe you come across on internet (or manually to enter a recipe you find in a book or by word of mouth). That in itself is unusual and valuable. But it also enables you to make weekly meal plans simply by dragging recipes from your recipe book to any given day. From your mealplan, the site edits a shopping list for the week. All this saves a lot of time and trouble and wondering what on earth you are going to give your family to eat. Plan to Eat has a very good periodic blog, dealing with aspects of cooking, buying food, nutrition, recipes and book reviews. Tortore is a fairly new blog. Darya writes in French, but the particularity of her blog is that it is entirely bilingual, she translates everything into English. I have chosen it for that reason and because her approach is healthy and uncomplicated, and her photos quite lovely. This is a wonderfully inventive and novel website, illustrated by artists from all over the world. The recipes are often quirky and a bit different. The artwork is amazing and colourful and I for one would like to paper my kitchen with it! Do browse the site, it is terribly addictive. So many wonderful recipes, a lot of them Asian and especially Filipino, it’s extremely hard to choose just one. Adora’s blog is attractive, chatty and informative, and once again, superb photos, lots of them! 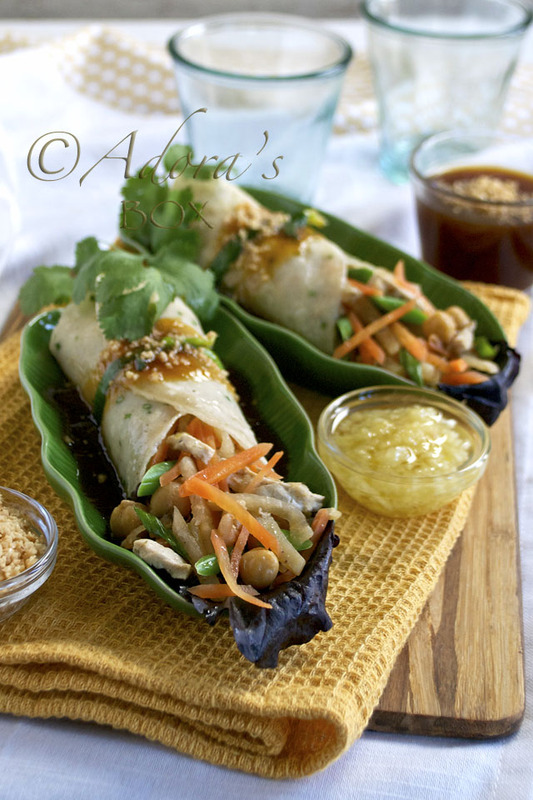 Here is her recipe for lumpiang, Filipino spring rolls. Another site that satisfies. Varied and unfailingly delicious, mouthwateringly tempting photos, and somehow an air of summer and the Mediterranean that soothes and comforts. 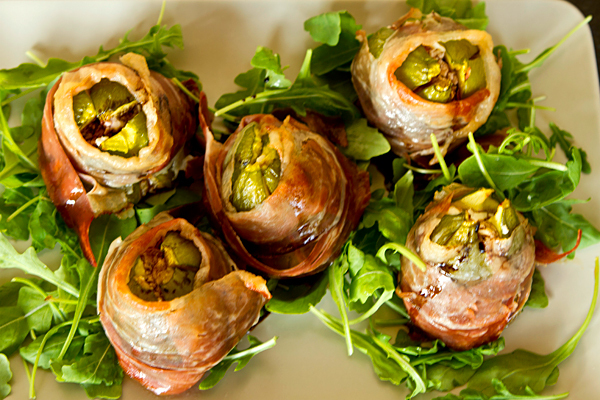 Here are her Procuitto-wrapped stuffed summer figs, which will confirm everything I have just written! I hope I have tempted you to browse some of these sites and their recipes. I may add that I have no affiliate or other link to any of them whatsoever. Bon appétit et Bonne Année, pleine de joies culinaires! Happy New Year, may it be filled with culinary delights! Whilst English and French cuisine are often separated by more than just a body of water, there is one festive tradition that unites that most British of beverages – ale – with a generous serving of French brandy to achieve a true entente cordiale! The word ‘wassail’ comes from the Old English ‘waes hael’, meaning ‘be healthy’ or ‘good health to you’, and the wassailing tradition can be traced as far back as the 11th century in the South and West of England. The exact timing of wassailing parties seems to have varied from Christmas Eve through to Twelfth Night, depending on local practice, so it’s a flexible as well as a jolly tradition that will see you right through to 2014. Cut the apples into slices, removing the seeds. Slice the orange and grate the rind from the lemon. Gently melt the butter over a low heat then add the sliced fruit, lemon rind, sugar and spices and stir for a few minutes while the flavours combine. Add all of the liquid and simmer gently for 30 minutes. Do not allow the mixture to boil. 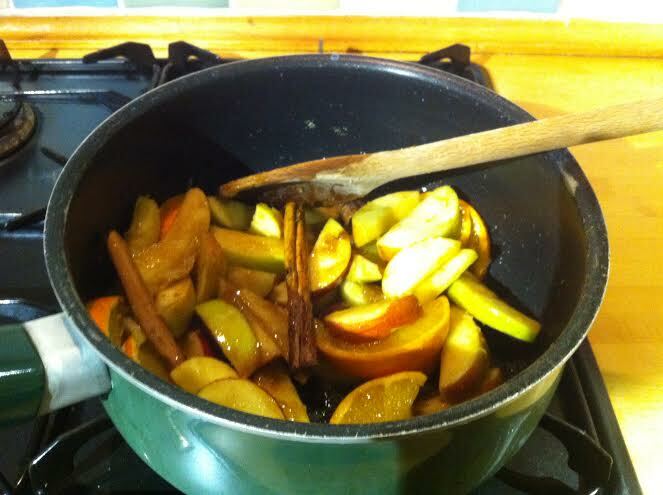 Ladle into serving cups, taking care to remove the nutmeg and cinnamon sticks first. 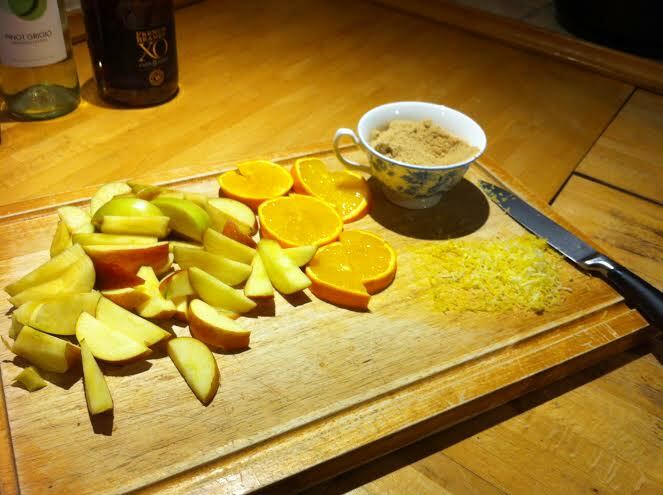 Your wassail will taste even better if made in advance and then gently reheated just before serving. 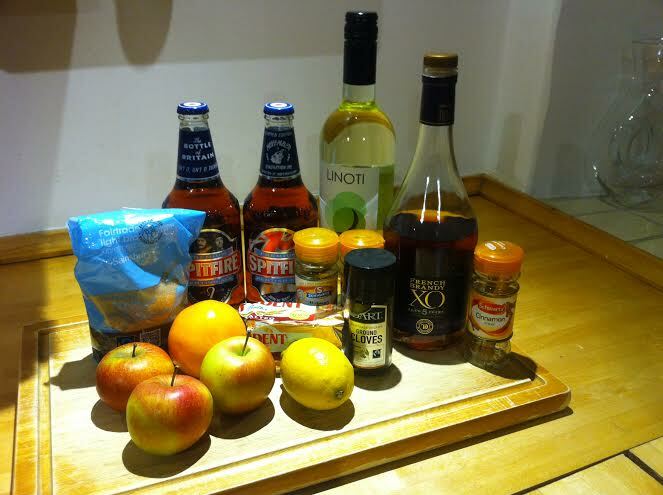 You can vary the spices to suit your taste, try mulling cider or apple juice instead of beer or substitute sherry for wine if you prefer a sweeter drink. The main thing is that you enjoy your wassail in good company, offering a toast of ‘waes hael’ and receiving the traditional reply of “drinc hael’, meaning drink well! Posted in Hot and cold drinks and tagged ale, apples, brandy, Christmas, Christmas Eve, Cinnamon, fruit, Old customs, Old English, punch, Twelfth Night, Wassail, West of England. Bookmark the permalink. 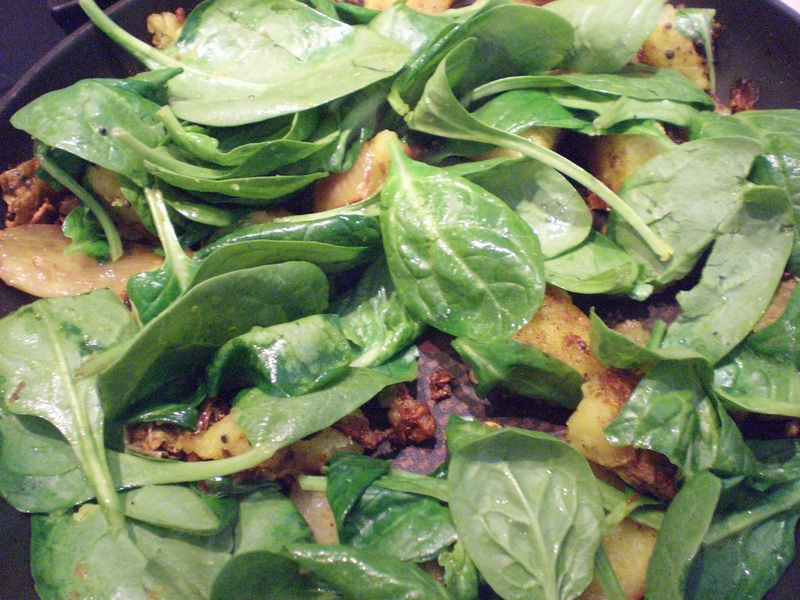 You either love or hate spinach. Most children won’t even come to table if there is spinach on the menu, but it’s a favourite vegetable of one of my little grandsons. Baby spinach leaves are preferable to larger, more mature ones, but the latter have more flavour. 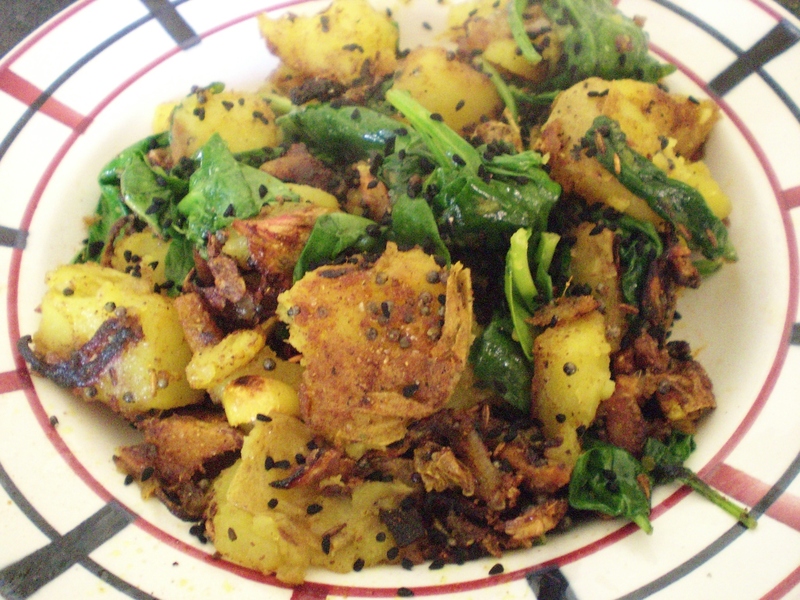 In India, spinach is used in an enormous number of recipes. Just wilted, it keeps its colour and a lot of its nutrients. I add a handful to all sorts of things – last night I had baked eggs with spinach, the day before the recipe I am about to share. I eat baby leaves in salad, wilted by pouring crispy bacon bits and their fat over them. épinards (masculine plural noun) (theoretically it has a singular but this is never used) = spinach (never pronounce the ‘s’ at the end of the word). We saw last year that the circumflex (^^) often denotes a missing s in English, that is, if you put an ‘s’ in the place of the circumflex, you will sometimes be able to guess what the word means. It is often the same with an initial é. Replace it with an s and you will have, sometimes exactly, sometimes near enough, the English word. So épinards = spinach; épice = spice, I can’t think of any more right now. Just one expression with épinards – mettre du beurre dans les épinards = to ameliorate something, to allow a little luxury (literally to add butter to your spinach), for instance a second salary will make everything easier = un deuxième salaire mettra du beurre dans les épinards. And so to the recipe. Cut the washed potato into 6 pieces (you do not need to peel it), place in cold salted water, bring to the boil and simmer for 15mns. Drain the potatoes and cut into smaller pieces. Heat the oil in a large frying pan, add the spices and the garlic, the ginger and the shallot to the hot oil and fry for a minute or two, stirring. Add the potatoes to the pan and stir to coat with the spices. Don’t be gentle with the potato, it is better if it crumbles a bit, it will go crispier later. 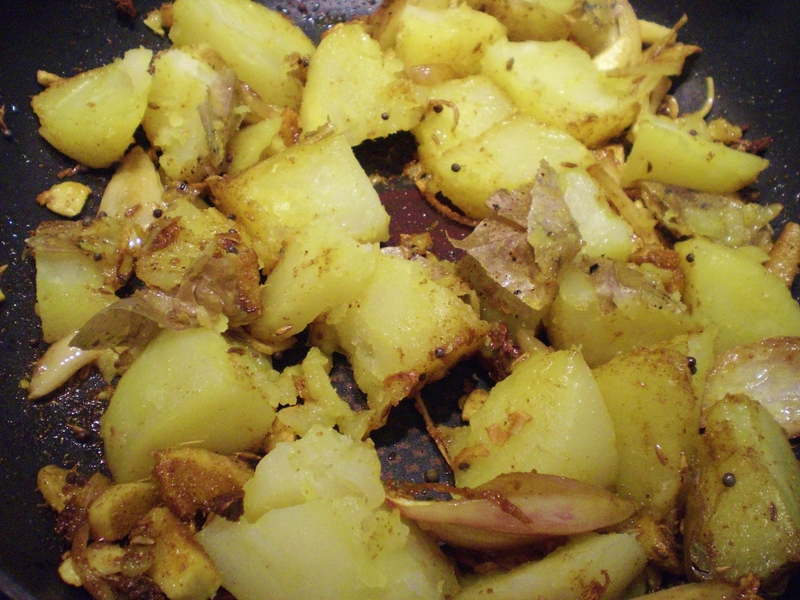 Fry for 10 minutes on a medium heat, stirring and turning the potato pieces so that they brown on all sides. It doesn’t matter if the shallot colours and crisps up. 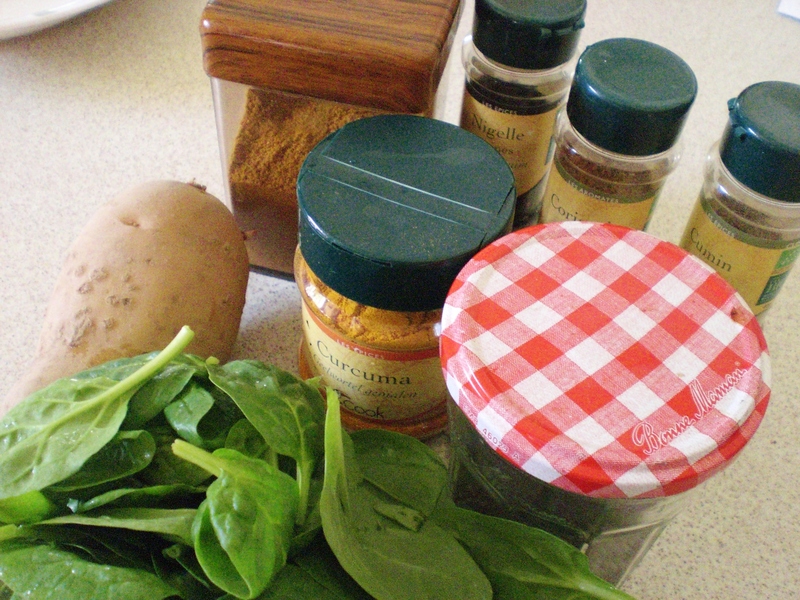 When the potato is quite browned, add the spinach to the pan, stir to wilt thoroughly, salt with great parcimony, as the spices have probably given enough flavour. You can always salt later if you find there is not enough. Sprinkle with a tsp of nigella seeds before bringing to the table. 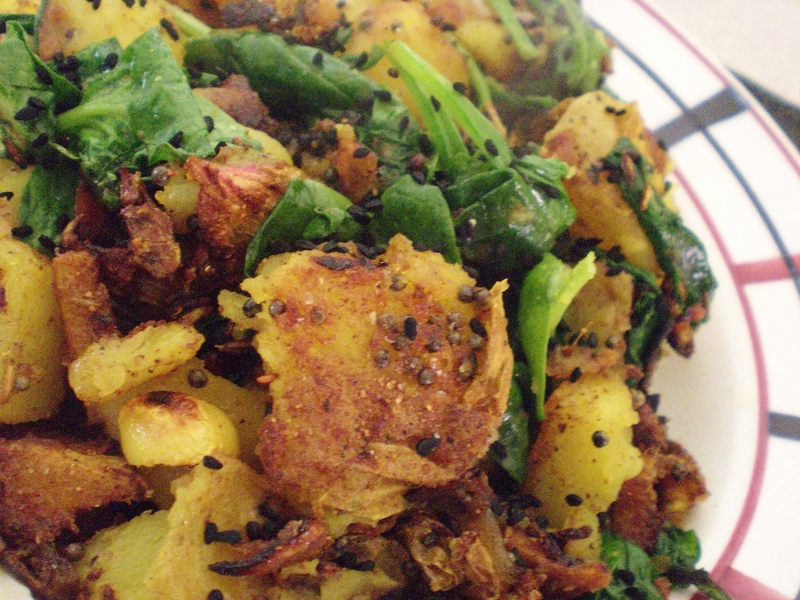 This is an excellent vegetarian dish, very satisfying. But if you feel you need meat, it can accompany any meat dish. 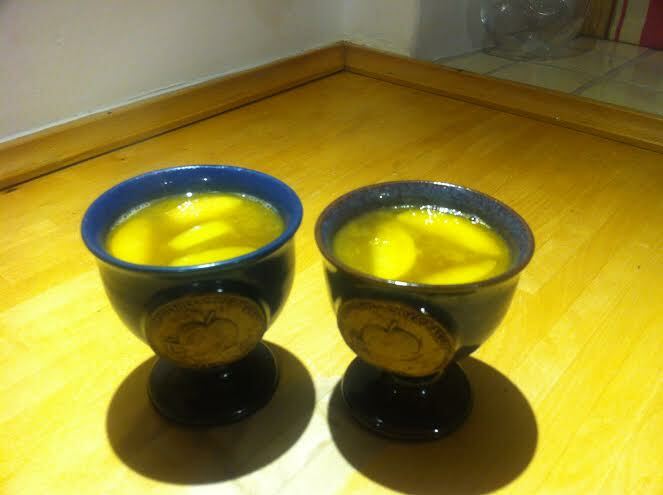 Of course I cannot pretend to have invented this, but let us just say that I used no recipe to concoct it! I just pulled spices out of the cupboard and thought very hard of a dish I tasted in India. Posted in Feminine Nouns, French recipes, Main courses, Nouns, Vegetables, Vegetarian and tagged Cook, Cumin, France, French food, French language, French phrases, French pronunciation, French recipes, French words, Indian, learn French, Nigella sativa, pomme de terre, Potato, pronounce, Recipe, spices, spicy, Spinach. Bookmark the permalink. 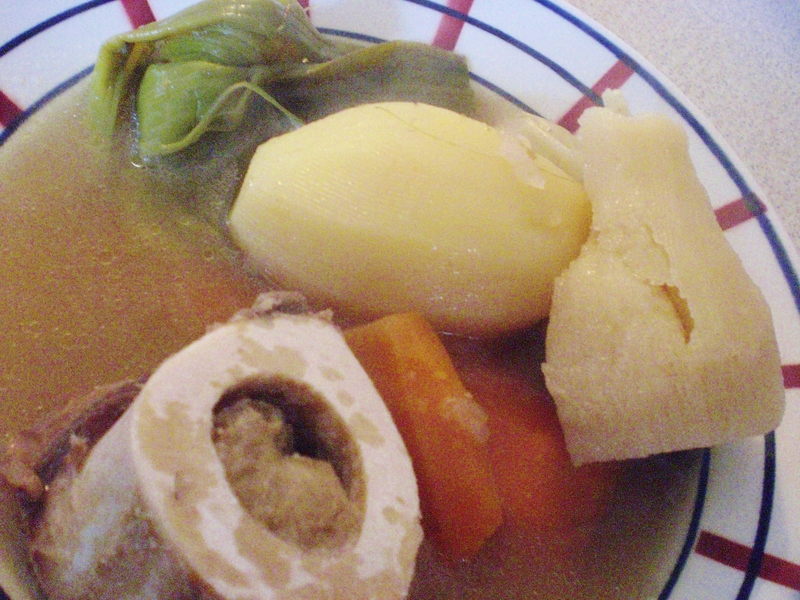 One French word: pot, a French recipe: pot au feu, classic beef and vegetable stew. 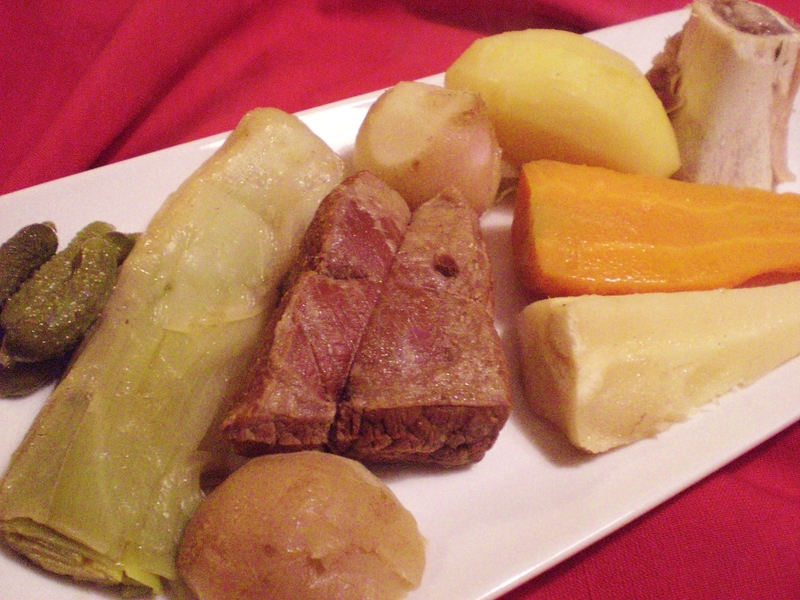 Half of France must eat pot au feu at the weekend in Winter. It’s a staple of the French diet, cheap and easy to do, comforting, and with its different variations on leftovers, lasts all week. 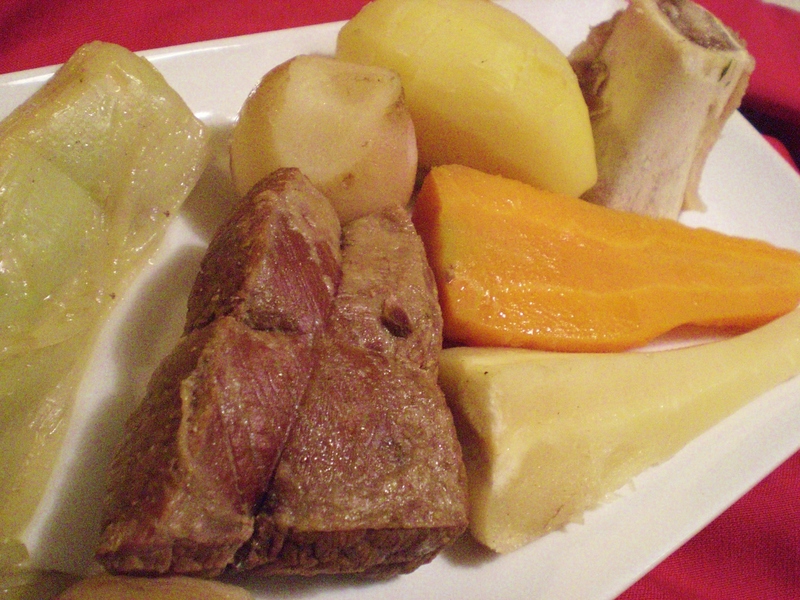 If not a pot au feu, then a potée or a ragoût, variously named each according to its region. Pot au feu literally means pot on the fire, and used to be a cauldron bubbling over an open hearth. Now of course it’s a presssure cooker more often than not (but not in my house, I’ve never understood pressure cookers). Un pot au feu is always made with beef, cheap cuts that need ample stewing, with onions (des oignons), leeks (des poireaux), carrots (des carottes), turnips (des navets), sometimes swedes (des rutabagas) and parsnips (des panais), and of course potatoes (des pommes de terre). It should stew for hours and hours, until the meat is meltingly tender, and the vegetables, some of which are just added half an hour before serving, tender and colourful. 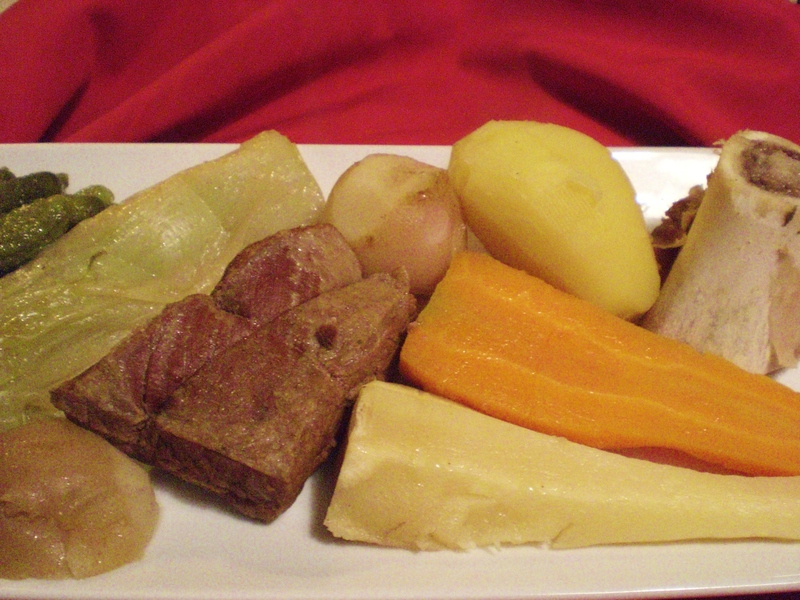 Une potée is usually made with pork, a hock (un jarret), some fat smoked sausages (des saucisses de Morteau for instance), a piece of salted pork belly (un morceau de petit salé), and maybe a trotter or two (des pieds de porc). Accompanied by vegetables as above, but often also a Savoy cabbage (un chou frisé) cut in two or four pieces, tops the pot. It is then known as une potée au chou. Un ragoût is usually made with mutton (du mouton ou de l’agneau), pieces of neck (du collier) and belly (du sauté d’agneau), fried first with a large onion, to which beans of one kind or another are often added. un pot is a pot; a flower pot = un pot de fleurs; a chamber pot = un pot de chambre; a bribe = un pot de vin (literally a pot of wine); a drink = (just) un pot; to be lucky = avoir du pot; an expression “le pot de terre contre le pot de fer“, literally an earthenware pot against an iron pot, in other words, an unequal combat, where one side is stronger than the other. But my recipe this week is for a pot au feu, the beef and vegetable stew described above. In a very large saucepan, or a pressure cooker, in which case you will have to modify cooking times all by yourself, place the meat (but not the bones) in enough cold water to cover it all amply. Add the onion, into which you have inserted the cloves (spices, not garlic), the star anise, a small handful of coarse salt, the whole garlic cloves, the whole green top of one leek, and one carrot cut into small pieces. Bring to the boil and simmer for 4 hours. Place in a cool place until the next day. Skim any solidified fat off the top of the contents of the pan and remove the leek greens, the star anise and the bouquet garni. Peel the carrots, cut them in halves or quarters lengthwise. Top and tail the turnips, leave the peel on. 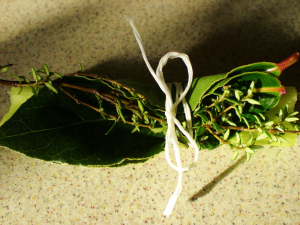 Wash the leeks and remove the tougher parts of the green leaves, cut them into two pieces. No need to peel the potatoes, just scrub them clean and cut into two or four if they are too enormous. Peel and cut the parsnips and swedes into pieces if you are including them. 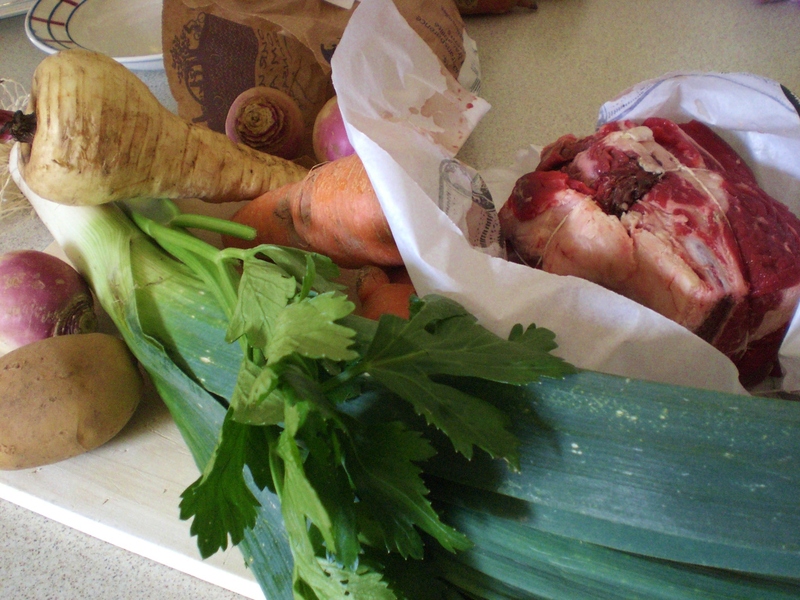 Place all the vegetables and the marrow bones into the pot (you see why you really need a very large one!). The marrow bones will add flavour and if you like beef marrow, will add an extra treat on your plate. Bring to the boil and simmer for half an hour. Serve each person a helping of meat, vegetables and a marrow bone. Add only a little of the bouillon (soup), it is nice to mash the potatoes in it. Place toasted bread, coarse salt and gherkins on the table to accompany. 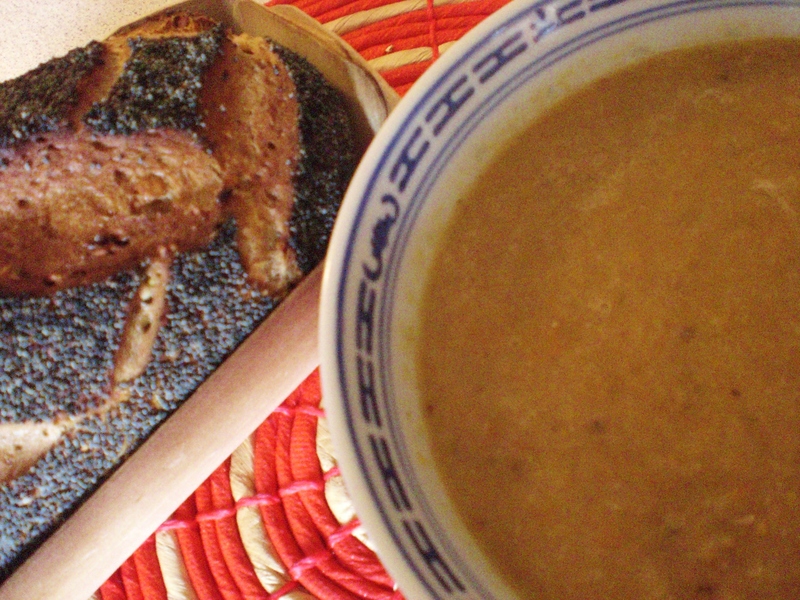 The marrow should be extracted from the bone, spread on toast with a little salt on top. Strain off some of the liquid into another saucepan, add some very fine vermicelli or alphabet pasta, heat for 10 minutes and serve as soup with crusty bread. 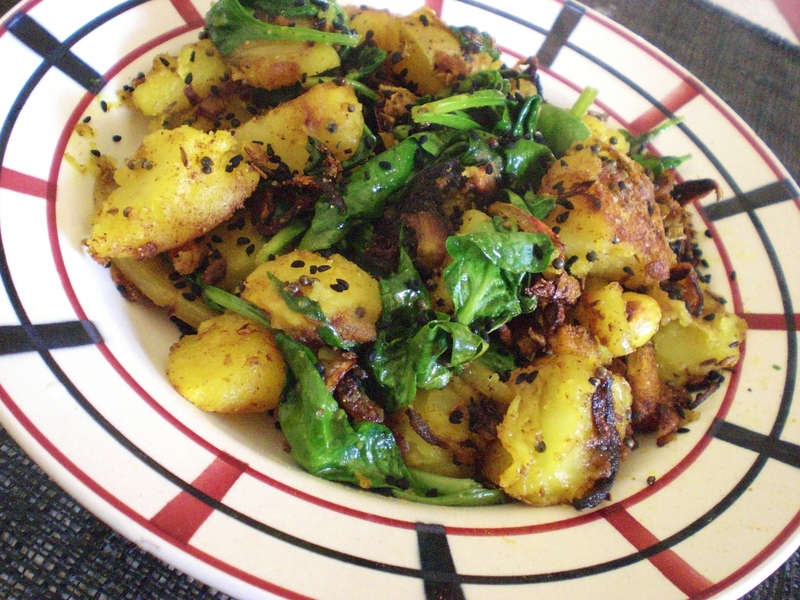 Boil some salad potatoes and season while hot with white wine, olive oil, salt and pepper. Add a chopped shallot, a chopped hard boiled egg,some chopped parsley and the rest of the pot au feu meat in 1cm cubes. This is a really excellent cold salad. Mix up whatever vegetables are left with the remaining bouillon with a soup mixer. I tend not to mix too much, to leave a rich coarse soup. It has become concentrated and is particularly flavoursome. So you see that with very little effort on days 1 and 2, you will have readymade dishes on days 3, 4 and 5 as well! Just be careful to keep your pot in the fridge if you have room, or in a very cool place (out of doors if Winter temperatures are near freezing). Posted in French recipes, Main courses, Masculine Nouns, Nouns, Salads, Soups and tagged Beef, Cook, France, French cuisine, French food, French language, French phrases, French pronunciation, French recipes, French words, learn French, Pot-au-feu, pronounce, Recipe, Soups and Stews, Stew. Bookmark the permalink.